Sabetha Family Practice has been participating in a Cancer Survivorship training called iSurvive, from mid-June through October 25th. Over a course of four luncheon meetings the staff and providers met with Carol Bush, BS, RN, and Trish Long, PA through KPPEPR (Kansas Patients and Providers Engaged in Prevention Research) to learn about how to best address patients who are living with the diagnosis of cancer over their lifetime, as cancer survivors. Many patients will have late and long term effects of treatments, and other special health needs unique to cancer survivorship. With the number of cancer survivors predicted to increase by about 31% over the next 10 years, KPPEPR is helping primary care providers, who are the central source of care and information for patients, be prepared to meet their needs. The meetings centered around how to approach patients who are survivors of cancer anytime over their lifetime, about any concerns that they have about how their previous cancer might affect their healthcare in the future. KPPEPRS also had many survivorship care resources for the providers to make available to their patients. 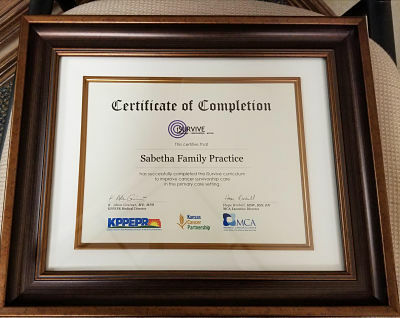 At the last meeting on October 25th, the providers and staff received a framed certificate for completion of the project.